The original Hillcrest Mardi Gras is back! Break out the masks, beads and doubloons and join us as we celebrate Fat Tuesday on February 28th with a street fair on University Ave. between 1st Ave. and 4th Ave. from 6:00pm-11:00pm. Hillcrest Mardi Gras will feature a night time dance party, laser production by Rich's Nightclub and Flicks, performances by Urban MO's Dreamgirls Revue, a costume competition, two bars, DIY mardi gras mask booth, interactive photobooth stylings by Hairspray Salon, carnivale performances by iL Circo, live Jazz music by Uptown Rhythm Makers, exclusive VIP area with private bar and your favorite Rich's Nightclub DJs. Hillcrest Mardi Gras is a 21+ Carnival. Costume competition begins at 10pm. Come in a festive Mard Gras themed outfit and win a chance to become QUEEN OF MARDI GRAS! Sign up for for the Mardi Gras Costume contest at the SheFest booth. VIP Tickets are $30 and $35 the day of and include access to an exclusive VIP area, private bar and restrooms, lounge seating and tons of beads! Food provided by Edible Arrangements, Fiesta Cantina, Baja Betty's. Beer provided by Hillcrest Brewing Company. Presale tickets, which are guaranteed to sell out! Hillcrest Mardi Gras benefits the development and preservation of Hillcrest through its partnership with the Hillcrest Business Association. Attendees must be 21 years or older and have a valid photo ID to enter. Main Gate located at 4th & University Ave. If you are interested in becoming a Hillcrest Mardi Gras sponsor or vendor, please contact the Hillcrest Business Association, Lifestyle + Events Director, Marisa Romero at marisa@hillcrestbia.org or call (619) 299-3330. 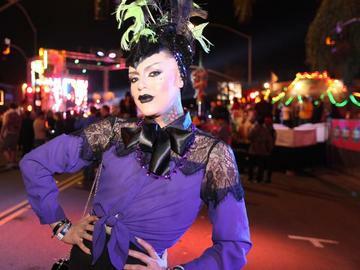 If you or someone you know are interested in volunteering for this year's Hillcrest Mardi Gras please contact the Hillcrest Business Association, Lifestyle + Events Director, Marisa Romero at marisa@hillcrestbia.org or call (619) 299-3330. Must be ages +21 over and present a valid photo id at event. All sales are final - Absolutely no Refunds!